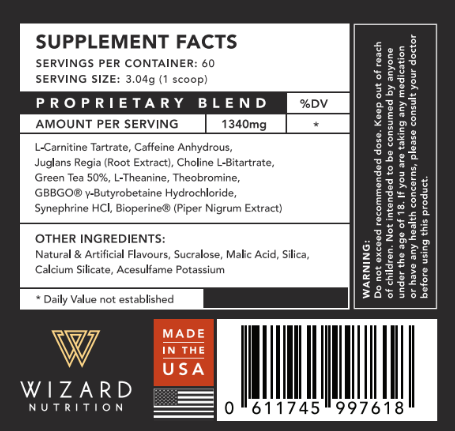 Fireblast Ultra Powder is designed to allow wizards to control their intake with high precision, and mix fat-burning potions to the strength that best suits them. One serving of powder contains half the stimulant content of a Fireblast Ultra capsule, and features extra ingredients (Acetyl L-Carnitine & GBBGO®) to promote rapid thermogenesis. Customize your dosage to suit your needs. Stick with a standard dose or gradually increase to find the level that is right for you. Q. Should I use Fireblast Ultra powder or capsules? A. If you have a low tolerance for stimulants, the powder might be a better choice. If you find the standard serving too weak, you can easily adjust the dosage. A. GBBGO® (γ-Butyrobetaine Hydrochloride) is essentially a stronger form of L-Carnitine, and has similar thermogenic effects.